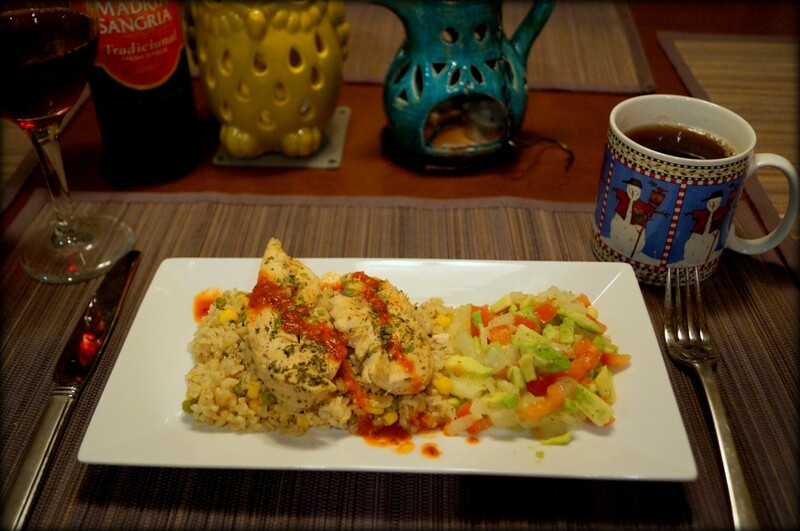 So I was in a rush tonight and decided to cook a modified version of the classic Peruvian Arroz con pollo. I used a rice cooker, dried cilantro amongst others to reduce the cooking effort as well as brown rice to stay on the “healthy side” — Here you go! 1 (Knorr brand) chicken stock cube (called bouillon cube). Always on the hispanic food aisle (check Target here). Please note you can avoid this if you use chicken stock(chicken broth) instead of water for the rice. Salt & pepper (to taste) — Keep in mind the chicken stock is already a bit salty. Defrost the chicken for 2 mins on the microwave (If you have time, you can lightly grill the chicken over olive oil instead). While defrosting, dump “all” of the above ingredients in to your rice cooker. Be sure to stir the ingredients and “taste” for saltiness. Then add the defrosted chicken, close and start the rice cooker. Once ready on the plate, sprinkle some dried cilantro over the chicken and red sauce as well (or serve on the side). Add some sangria for a great night. That is all for the main dish!